NOTICE OF APPROVAL OF STATUS. I am an American. I married Greg, a Barbadian citizen, two years ago and applied for citizenship six months ago. I was excited to keep reading …. 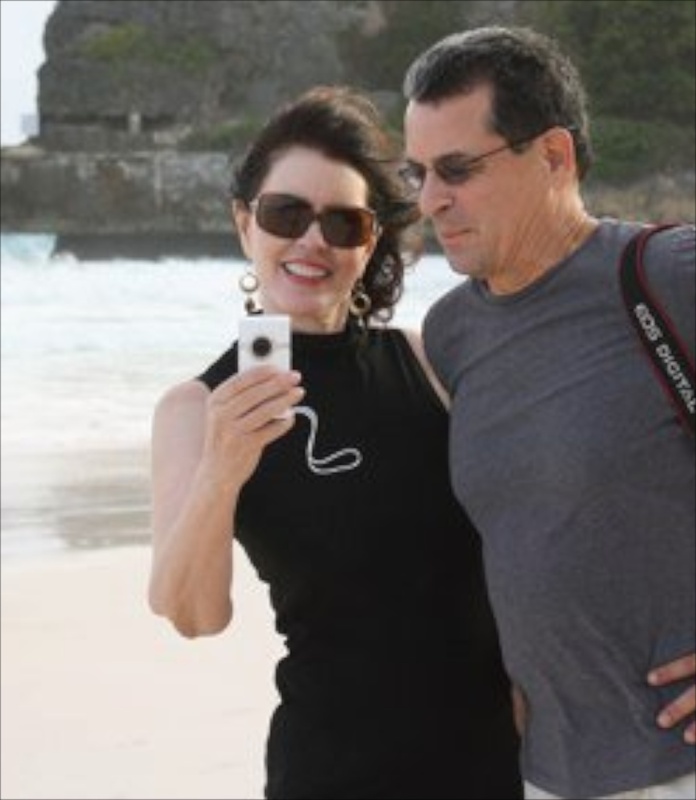 Greg and me, almost-a-Barbados-citizen, on Crane Beach, February 2011. I danced around my apartment and called Greg at work to share the happy news. Yippeeeee, I was on my way to becoming a Barbadian citizen! “Reside and Work” status allows me to stay in Barbados instead of requiring me to leave every 30 days; it also allows me to get a job here. As quickly as I’d been elated I was crushed. The 28 days had already expired! I had been required to pay the fee even before the letter had been sent out! 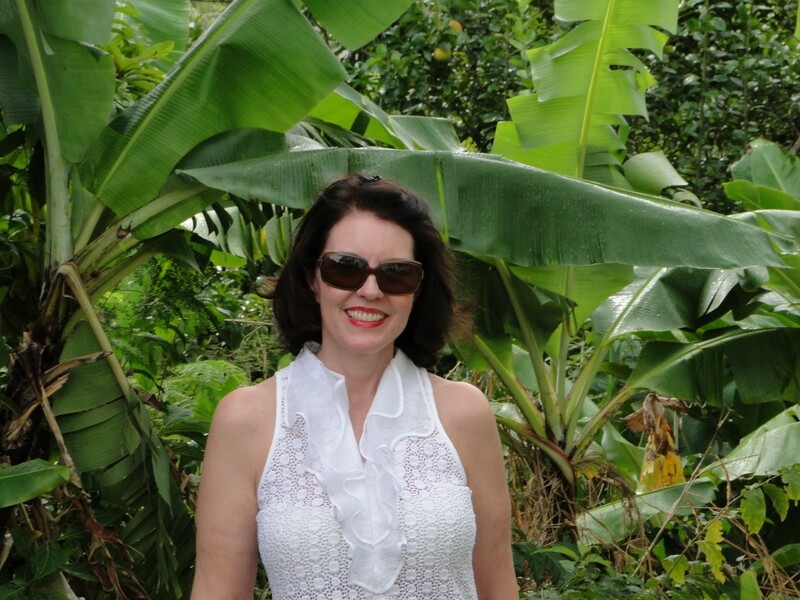 Me, loving life amongst the banana crop – and everywhere else – in Barbados. Jan 2011, photo by Sharon Steenveld. A very nice person at Immigration told me not to worry, to just bring the thousand bucks. Ahhhh, government agencies .. gotta luv ‘em. I am now in possession of a lovely piece of paper with a big stamp on it noting payment of the fee and granting of Reside and Work status in Barbados. I’m glad citizenship isn’t easy. I’m glad it’s not a given. If everyone who wanted it was granted it, there’d be 10 million citizens of this paradise. Yes, I keep telling her she has to learn the Queen’s English, not the President’s. Next, have to teach her Bajan cuss words! She’ll know those words already, from driving around Barbados! Haha, I guess I do know “those words” from driving .. mostly from other drivers shouting them at me! If all these Britishisms are required, then colour me happy; I’m happy to start spelling ‘organisation’ and pronouncing schedule without the hard ‘k’ … just don’t ask me to eat souse – that’s a bridge too far for this Yank! The things you do for love… wasn’t that a song from 10cc back in 1976 or something? Changing my keyboard is a No Can Do, I’m afraid! When I’m in Europe using a hotel’s keyboard my e-mails are quite odd indeed. Great news for you Jane. One step closer. Are you keeping your American Citizenship too? Oh, yes, Rainy, I’m an American through and through and will always be. Sorry to make you go back so far to read this response, lol. but… I am beginning what will hopefully be a transition to Barbados within the year. Your story may only be specific to YOU, but it is helping ME along tons! I have to make a point to go back and catch up on all that has happened in your journey (I first read the “Neither Easy Nor Quick” entry). Your blog keeps my spirits high! THANK YOU FOR SHARING, Jane! You have to be kidding me, Greg. Jane should already know those cuss words. Anyhow, I’m very happy for you Jane – see you soon. So happy for you Jane and you still look gorgeous ! Island life fills the soul and warm the heart. Thanks, Janice. Yes, island life is very good indeed. I hope you’re well and that the kids are happily living their lives as grown-ups … goes by fast, doesn’t it? Take good care and thanks for dropping by my much-too-neglected blog .. ! I hope this email finds you and yours well. I stumbled across your post when looking for an old barbados expats forum which is now defunct. Your last post was 2014 and I know it is some years since you received your status but may I please ask how long did it take you to get your status from beginning to end of the process.